Medium sized memorial urn is decorated in two void materials to perfection from skilled craftsmen and curved from solid brass metal in high modernised classical creation. 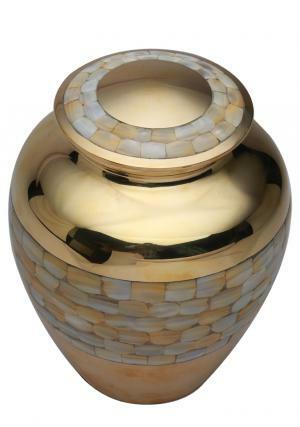 Mid sized cremation urn has brass combined with mother of pearl at the center. 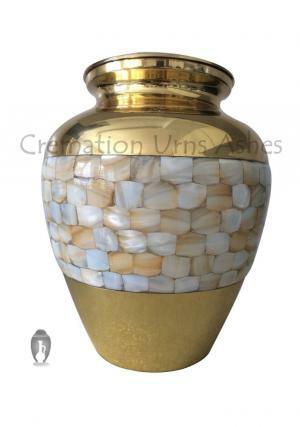 Elite Mother of Pearl memorial urn is a perfect way to honour the loved memories by preserving the ashes which makes the family to get relief from pain. Medium sized funeral urn is secured of threadings on the top, used for insertion of ashes and the closure. 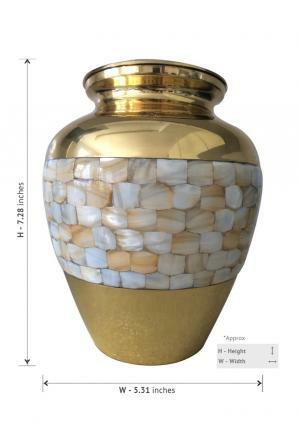 Mid sized funeral urn is capable of preserving 90 cubic inches of burial ashes or cremains and the mid sized urn weighs 1.06 Kg measured to 7.28” inches height, 5.31” inches width.